Give your toddler the gift of knowledge and ability. Give them an environment of affection and respect for their potential. Feed the magic of their brains. “Tiny children have just five ways to learn about the world. They can see it, hear it, feel it, taste it and smell it. No More. Everything a child learns in his life he learns through these five paths. The sensory pathways actually make up the entire back half of the brain. Children who are permitted to learn when learning is easiest don’t spend much time being bored or frustrated or causing upsets in order to get attention. They lead happier lives,” – Glenn Doman, founder of The Institutes for the Achievement of Human Potential, Janet Doman, How to Multiply Your Baby’s Intelligence, 2005, Garden City Park New Jersey. This is why Montessori education for Toddlers and preschoolers is so brilliant. 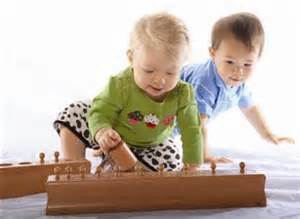 Dr. Montessori emphasized Sensory Learning. In other words DON’T waste these most precious years (1yr-3yrs) of your child’s foundation. Contact us today for more information on tuition and enrollment.